This is a rare opportunity to own a one level ranch home set on a large level lot in the prestigious Sun Dance neighborhood on Prune Hill! 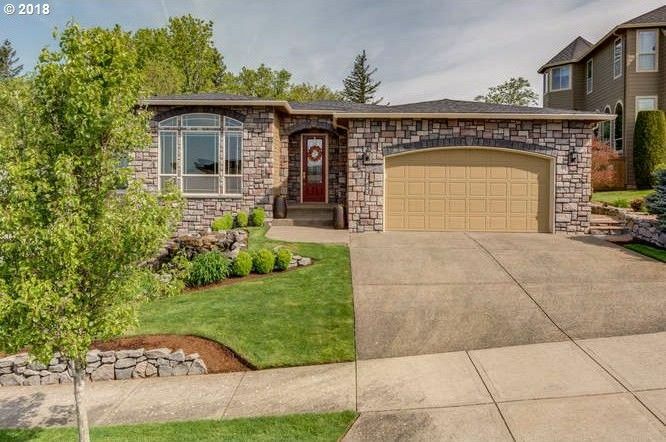 This home has breath taking views of the Columbia River and Portland city lights. Elegant yet comfortable, this home is rich in detail and features custom wood work throughout, coved ceilings, crown molding, built in cabinets, Brazilian cherry floors and travertine! The grand entry opens to the living room and den that share a double-sided fireplace. The chef’s kitchen features a large dining bar, slab granite, stainless appliances and a casual dining area. This 2800 square foot home also features a formal dining room, large open family room with another cozy fireplace, a large master suite with a walk-in closet/dressing room, 2 additional large bedrooms with a Jack and Jill bath. Relax on the new easy care Trex deck while enjoying your favorite music through the surround sound. Professional landscaping features front and back water features. Sought after Camas Schools!